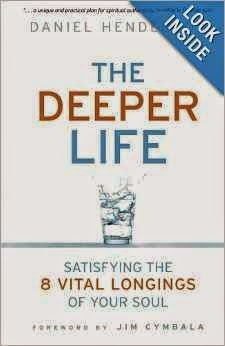 A month or so ago I received a copy of The Deeper Life by Daniel Henderson to review. I wasn't really sure about it, because I'm kind of to a stage where I'm burned out with self improvement books that are all saying the same thing. But I thought I would give this one a try, by an author I hadn't previously heard of. This book is set up in a somewhat confusing format, (I wish they would have all parts of each section together, not the reading part in the front, the questions to work through in appendix 1 and his examples in appendix 2, etc.) But, really, that was the ONLY downfall of this book. Once you get used to that, everything he has you work through is amazing. Things that I had never thought of before. how you would like to finish your life. Stuff I didn't even realize I was missing. And the awesome thing is that it speaks right directly to where I am right now. The issues I struggle the most with, I now have a statement of truth about them now. So when discouragement, lies, or exhaustion set in, I can re-read the truth about who God is, and who I am and refresh my weary soul. I'm still working on fine tuning some of the projects in this book, and I imagine I will be for a lifetime. So thankful to Pastor Daniel Henderson for taking the time to write this book. No doubt he'll help thousands of people clarify the most important issues of life. Then commit to working through the sections. I just saw this on your reading list post for 2014. And after reading your above review, I'm in! I bought it so let's see what happens!! Awesome! It's a lot to think about and work through, but so worth it!! Hope you enjoy it!